There will be no REB Talks on Thursday, February 14th. The program will resume on February 28th. See you there. All are invited to study the Bible with Rabbi Robbie. Bagels and coffee are provided for all wishing to explore how the Bible is a mirror of our lives. No previous knowledge is required and all backgrounds are welcome. On this morning, we will begin our discussion about the mysterious prophet Elijah. Come be a part of something meaningful!!! Two Events… One night of fun!!! The evening kicks off with a demonstration by our own Mixologist/Bartender, Ava Sanel, who will teach us the ins and outs of how to make some special cocktails. Bottoms up!!! Following that, we will flex our Jewish trivia muscles with a fabulous game of Jewpardy. There will be all types of categories (holidays, culture, Jews in sports/entertainment). Individuals with all levels of knowledge are encouraged to play. The game will be hosted by our own Rabbi “Alex T” (aka Rabbi Robbie). The evening promises to be a great night of fun and community. The cost is $18 for members and $21 for non-members. Register by clicking here. When do I sit? Why do we bow at certain times? What is the meaning of the Kaddish, anyway? We all probably have these types of questions before we enter Friday evening services and the questions keep coming as the evening progresses. Well, Shabbat 101 is here. Rabbi Robbie will be conducting two learning Shabbat services to help us understand the prayers, their deeper meanings and the powerful nuances within their poetry. By the end of the sessions, we hope you will feel more comfortable during Shabbat services. 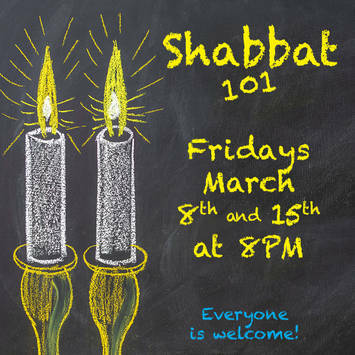 Join us for these spiritual and educational Shabbat experiences.